The Chinese government has managed to infiltrate more than 30 US companies, including Amazon and Apple. At least that's the conclusion of a year-long investigative journalism operation by Bloomberg. Amazon, Apple and the US and Chinese governments firmly deny the allegations. But then, of course they would, wouldn't they? It's either the biggest tech espionage story in history, or Bloomberg has a lot to answer for. Today, I'm going to lay out what's happened and let you decide for yourself. Here is the crux of the story. In 2015 Amazon looked into acquiring a startup called Elemental Technologies (ET). ET made software that could make Amazon's video streaming services work better. ET already had lots of high-profile clients. Its technology had been used to stream the Olympic Games, communicate with the International Space Station, and send drone footage to the CIA. When Amazon did its due diligence on ET's tech, however, it found some... "issues". This prompted it to look into the company that assembled ET's computer hardware, Supermicro. Nested on the servers' motherboards, the testers found a tiny microchip, not much bigger than a grain of rice, that wasn't part of the boards' original design. Amazon reported the discovery to U.S. authorities, sending a shudder through the intelligence community. Elemental's servers could be found in Department of Defense data centers, the CIA's drone operations, and the onboard networks of Navy warships. And Elemental was just one of hundreds of Supermicro customers. Just how small are those chips Bloomberg is talking about? Helpfully, it used a photo of one on the cover of its October magazine edition. As you can see below, they are tiny. Where did these spy chips come from? China, of course. The chips had been inserted during the manufacturing process, two officials say, by operatives from a unit of the People's Liberation Army. In Supermicro, China's spies appear to have found a perfect conduit for what U.S. officials now describe as the most significant supply chain attack known to have been carried out against American companies. One official says investigators found that it eventually affected almost 30 companies, including a major bank, government contractors, and the world's most valuable company, Apple Inc. 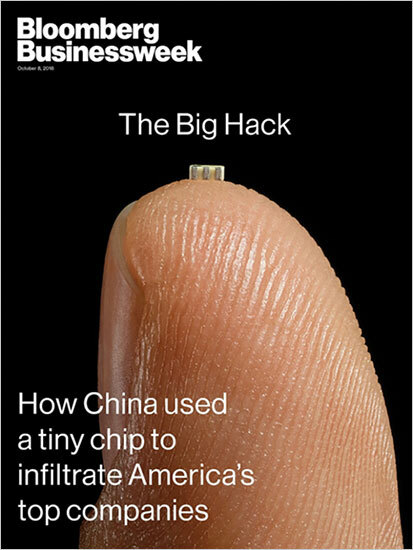 So to sum up, Bloomberg claims China has infiltrated US computer networks at a deep level. China managed to bug the systems used to relay top-secret information for major US companies and security services alike. If the claims prove to be true, this would be a monumental piece of espionage. As you may expect, everyone Bloomberg names has denied the claims. From Apple to Amazon to the US government to China. No one is admitting anything of the sort has taken place. Bloomberg states it has had more than 17 insiders confirm its facts. These range from people deep inside Apple to former and current national security personnel. The problem is, all these sources remain anonymous. Naturally, people are skeptical of this "spy chip" story. On one side you have Bloomberg's decades-long stellar reputation and reporting acumen, a thoroughly researched story citing more than a dozen sources - some inside the government and out - and publishing enough evidence to present a convincing case. On the other, the sources are anonymous - likely because the information they shared wasn't theirs to share or it was classified, putting sources in risk of legal jeopardy. But that makes accountability difficult. No reporter wants to say "a source familiar with the matter" because it weakens the story. It's the reason reporters will tag names to spokespeople or officials so that it holds the powers accountable for their words. And, the denials from the companies themselves - though transparently published in full by Bloomberg - are not bulletproof in outright rejection of the story's claims. These statements go through legal counsel and are subject to government regulation. These statements become a counterbalance - turning the story from an evidence-based report into a "he said, she said" situation. You can't publish claims like Bloomberg has without damming proof. If you didn't have proof, you could be sued into oblivion for defamation. Bloomberg is big enough and versed enough to know this. And it also must have known that all the companies and agencies it named would outright deny any of this has taken place. And so far there is no news that lawsuits against Bloomberg have been filed. So on that level, we'd have to conclude there is some proof to the allegations. However, it would certainly be good to see more evidence than Bloomberg has provided, and maybe one or two witnesses willing to go on record. Perhaps Bloomberg is hoping that with all the attention this story has generated, more people will come forward. Or, perhaps, it's all fake news. Perhaps Bloomberg was told to run the story by the US Secret Service in order to discredit Chinese manufacturing. Perhaps that's why it's not being sued. Because the powers that be told it to run the story. Or perhaps, the US set it all up to look like China had been infiltrating its top companies. I mean, if you want to bring manufacturing back to the US and take the market away from China, what better way than to do it than with an expose like this? You could get your important computer equipment from China, on the cheap, but there's a good chance the Chinese will have compromised it. Or you could pay a bit more and get it made in the US. A country you can trust. Although, that argument falls down when you remember things like the US's PRISM program that Edward Snowden exposed. Still, it can't hurt to discredit China when you're in the middle of a trade war with them. Hopefully over the next few months we'll learn the truth. Until then, it's difficult to know who to believe and what may come of it all. Please note: This article was first published in Exponential Investor on 10th October 2018. Harry has been mad about technology since he was a child, growing up in the days of MS DOS and floppy disks. At university Harry, unsurprisingly, studied multimedia technology before completing a post-grad NCTJ certificate in journalism. He has worked as a financial writer for the better part of a decade and was an early adopter of crypto, having owned Bitcoin since 2013. His passion is researching and writing about world-changing tech. We request your view! Post a comment on "You Can't Handle the Truth". Thank you for posting your view!